Ahh yes, tablescaping...my long lost friend. "I need a pretty tablescape!" The warm colors of Fall are always a welcome sight this time of year. Wicker placemats from Pier 1. 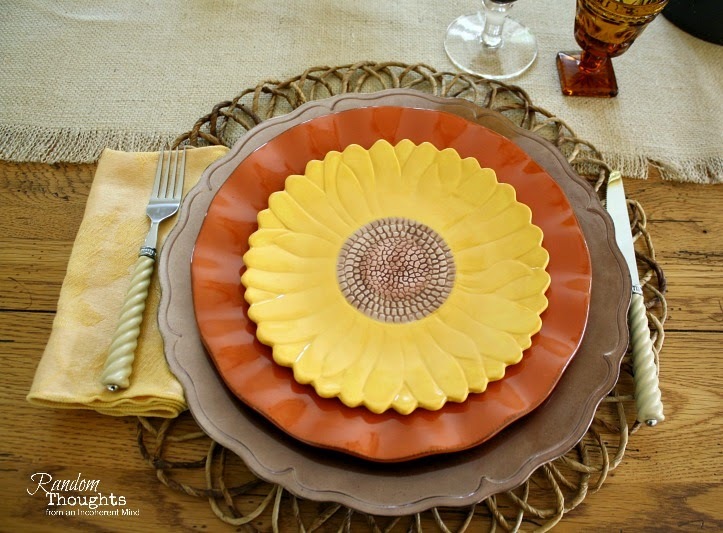 Orange Dinner plates from Walmart, Better Homes & Gardens collection. Sunflower plates from Christmas Tree Shop. Napkins from Bed, Bath & Beyond. Flatware...a mystery. For the life of me, I can't remember! Park Lane wine glasses from local antique shop. Burlap runner from Home Goods. Black enamel splatterware coffee pot from local antique shop. had not changed when I took these photos several weeks ago. It's turning a vibrant red now. issues, which I'm hoping are resolved soon. I could scream... it's all very frustrating. I Love your tablescapes always! The fall decor on your light above looks pretty too. I'm still lovin those curtains, so light and airy! You always do a great job Gina. Very inspiring! Oh so pretty! 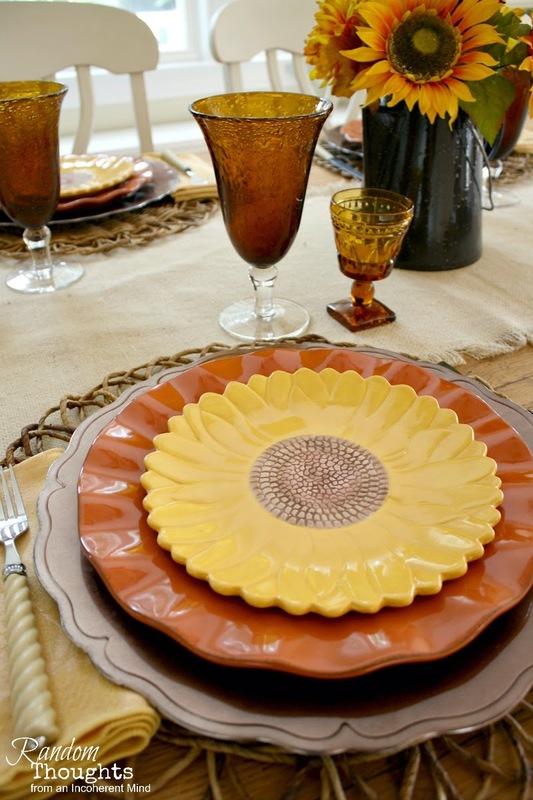 Love the sunflower plates. I hope you get your computer issues resolved soon! I've been there. There is nothing more frustrating! Oh, what a beautiful tablescape!! I'm sorry that you are having computer issues. That is so frustrating! Hopefully, you'll get everything ironed out soon. Gina.. you know that I love everything you do and the sunflowers are no different. super cute. I'm one who "gets" it. I haven't done a tablescape in a while, and I was just telling my family that playing with dishes would most definitely perk up my mood. There is no prettier time of year to play with them than the fall to me, and I love your colors and sunflowers. Another gorgeous tablescape, Gina! The dishes are beautiful. 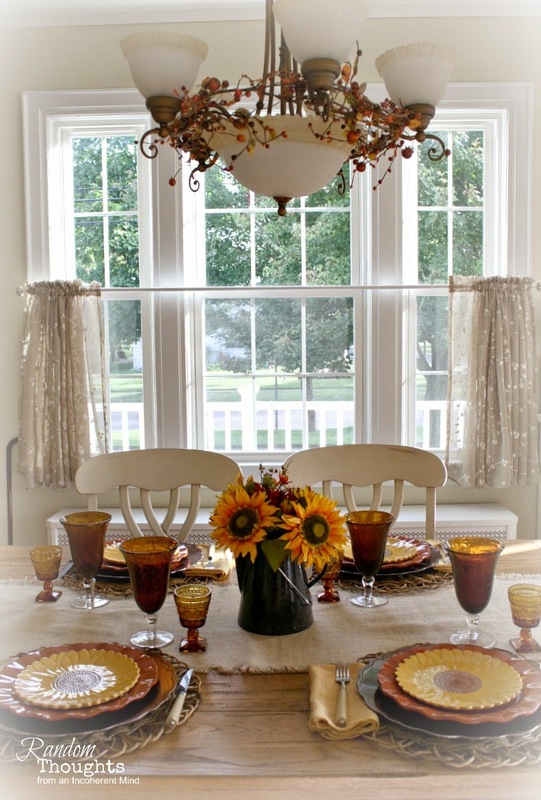 You always put together such wonderful tablescapes! Gina girl, oh I get it! lol! 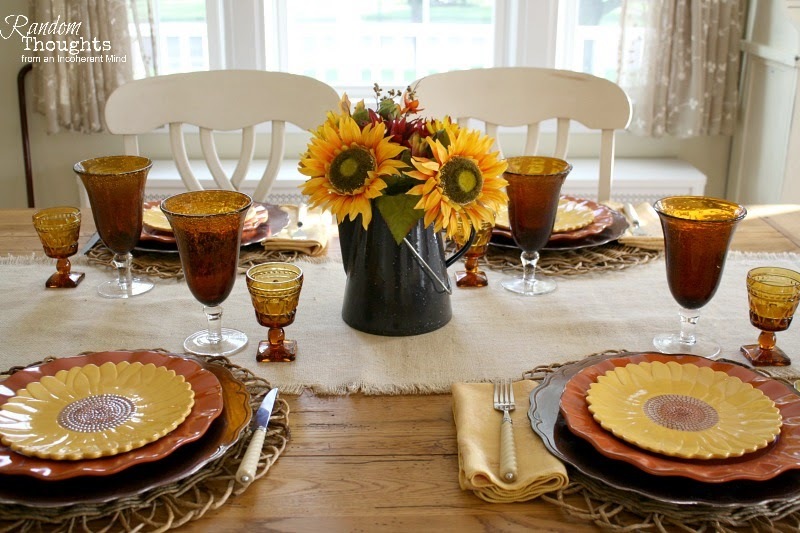 Your table really is just perfect for Fall. I bet the red tree is absolutely gorgeous now. 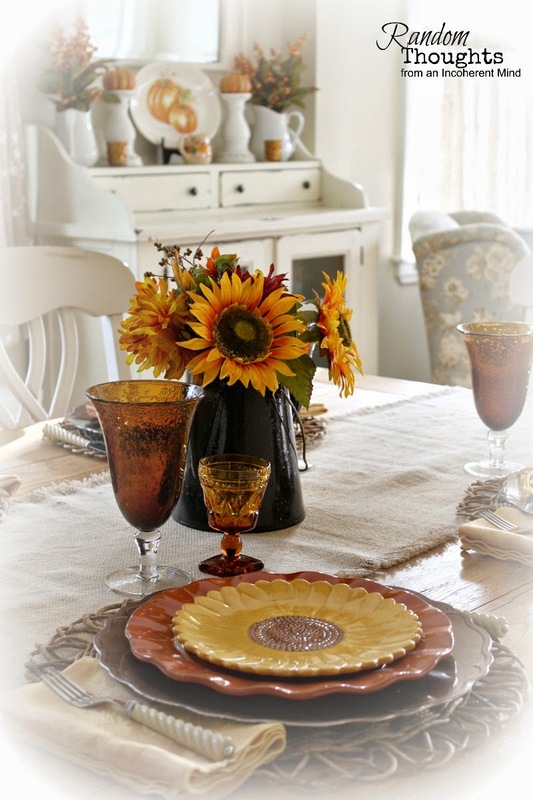 I love the sunflower plates and the enamel pot pitcher! Sorry to hear about computer problems. Not good! Your tablescape is wonderful. I love the warm colours of fall. Yours doesn't disappoint! See, chum? I get it TOTALLY! Hugs. My favorite is always sunflowers Gina. They just make me happy and smile this time of year. Your table is gorgeous! Gina, your table is so pretty. 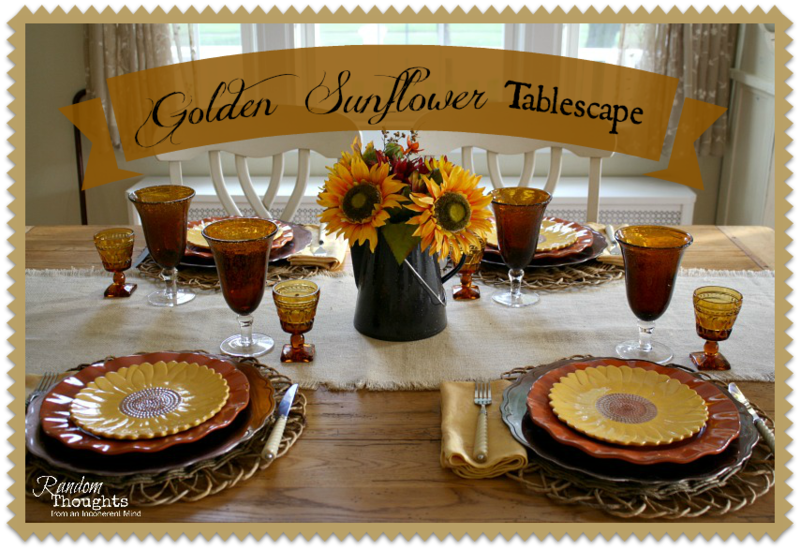 We all love sunflowers and this table sure reflects how pretty they are. Now this is what I love to see! Your beautiful tablescape is such a delight. The combination of everything is terrific!